Seasonal affective disorder (SAD) is a type of depression that is related to the seasons. In most people, SAD strikes in winter, so for this reason, this article will focus more on this type. However, it should be noted that there are rarer cases of people developing seasonal depression in the summer months. Read on to discover more about this disorder. Depression is a constant feeling of sadness or hopelessness that does not go away and makes it impossible for the sufferer to maintain a positive outlook on anything. People with SAD will notice the symptoms start and finish at around the same time every year - normally when the days become shorter and the temperature drops. SAD tends to affects more women than men, and in addition seems to be more prevalent in younger people, most notably those between the ages of 18 and 30. Although there seems to be a strong correlation between lack of sunlight and onset of SAD, the exact causes of SAD are not fully understood. The production of melatonin and serotonin is believed to be affected by exposure to light, and these chemicals regulate sleep and mood. However, more research into this area needs to be carried out in order to reach any concrete conclusions. Although some people find these to be helpful, the evidence behind them is weak. They are based on the theory that the light mimics daylight, producing the same chemical effects in the brain that would happen in the summer. This might be true, but in the current absence of solid data to back up the claims, they might be little more than an expensive gimmick. Although widely believed, and attributed to a rise in depression because of the weather, this idea is actually false. In fact, a proper look at the statistics shows that suicide rates actually drop during the winter season and peak in the spring, and experts believe that the reason for this has absolutely nothing to do with the weather. Instead, it is thought that the social aspect of the Christmas holidays are the reason people are less likely to feel suicidal, whereas after Christmas, debts can be high and the social support network might disappear. 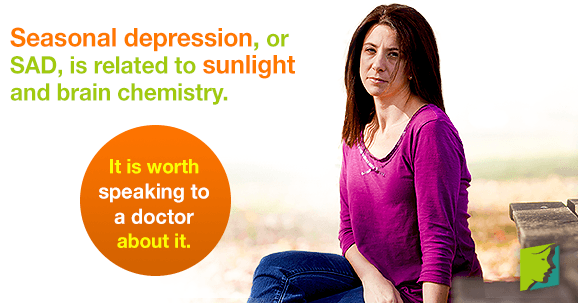 Seasonal depression is similar to depression except it occurs only at certain times of the year. Most people will find the depression will lift after the season comes to an end, but it is nevertheless worth speaking to a doctor in order to find out ways to deal with it. Read more about winter depression.